Maine teenagers say their teams provide support as they work to follow their religion's tenets. PORTLAND – At 4:30 in the morning, Mashale Nabi’s teammates are probably still asleep. But for the past four weeks, around that time each morning, Nabi wakes and consumes a breakfast of yogurt, fruit, cereal and plenty of water and Gatorade. Nabi, a sophomore at Portland High School, isn’t exactly enthralled with the idea of waking up before the sun rises and like many teenagers, she values her shut-eye. But these days, waking up early is a necessity for her to adhere to one of her core religious beliefs. It is Ramadan, and as a practicing Muslim, Nabi must prepare properly for a day of fasting that begins when the sun rises, which means proper nutrition and hydration. What compounds these days is the fact that Nabi is going through preseason practices with the Portland girls’ soccer team. Nabi and Horor are part of a small group of high school athletes who, while preparing for the fall sports season, are fasting from sunrise to sunset in observance of the Muslim holiday. Nabi can’t refuel by eating a midafternoon banana or an energy bar. She cannot even have a sip of water. She is the only player on her team who fasts in observance of Ramadan, the holiest month of Islam. One of the five pillars of Islam — along with charity, prayer, the profession of faith and the hajj (the religious pilgrimage to Mecca) — Ramadan is observed worldwide, even in the Muslim communities in Maine that are predominantly found in Portland and Lewiston. Ramadan spans the course of 30 days and is observed during the ninth month of the Islamic lunar calendar, which varies from year to year. This year, Ramadan ends Thursday and is followed Friday by the Eid al-Fitr, a three-day celebration that marks the end of fasting. Nabi remembers the first time she observed Ramadan, when she begged and pleaded her mother for a glass of water. She was in middle school and didn’t understand the scope of the holiday. Her mother put it in simple terms for her. According to the Pew Forum on Religion and Public Life, there are nearly 1.6 billion Muslims worldwide, including 1.8 million in the United States. According to the Islamic Center of Maine, the state’s Muslim population is about 10,000 and includes Afghanis, Somalians, Kurds, Bosnians, Iraqis, Iranians and Americans. Jondy, who works with high school and college students in the Bangor area, attributes the growth in understanding to the push for education about Islam, and for the growth of Islam in the American population, as more second- and third-generation Muslims are now in their teens and 20s. 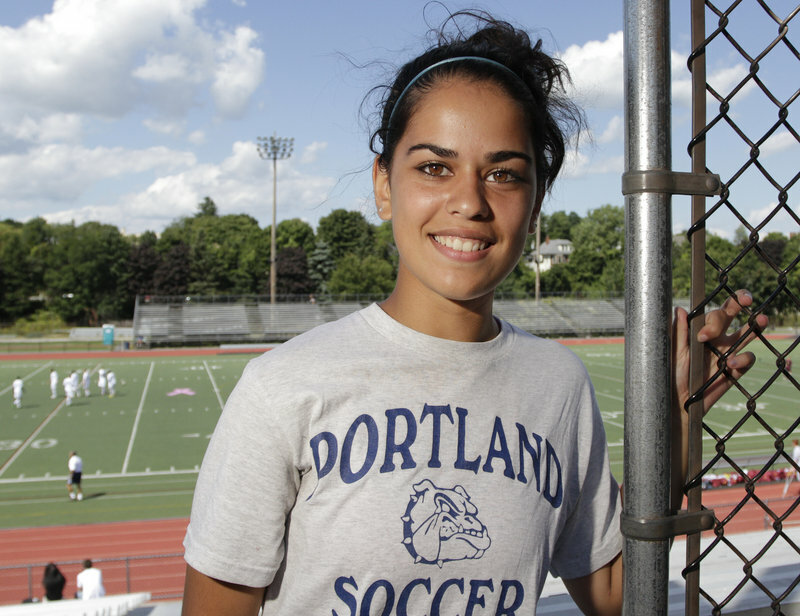 Portland Athletic Director Mike McCullum did not have an exact number of student-athletes who observe Ramadan, but Nabi and her older brother, Fazal, who is on Portland’s boys’ soccer team, are two. Lewiston Athletic Director Jason Fuller estimates there are at least 20 student-athletes at the high school who observe Ramadan, and remembers the issue first arising about eight years ago, when an influx of immigrants settled in Lewiston. This year, Ramadan began six days before the start of fall sports practices in Maine. Many who observe Ramadan wake prior to dawn for a meal that is meant to sustain them until sundown. This is the second year Ramadan has fallen during the preseason, at a time when players are working toward earning spots on the team, doing so in hot weather and humidity. At several high schools in Maine, Muslim student-athletes are balancing the observance of their faith with their athletic endeavors. It’s challenging at times — for the athletes who must fast from sunup to sun-down, as well as observe a timetable of prayers; for coaches who may have never worked with an athlete whose religion requires a strict observance schedule; and for athletes who may wonder why a teammate is forgoing a water break or is ducking away from the field and looking away, in the direction of Mecca, the birthplace of the Islamic prophet Muhammad. In more than 20 years of coaching boys’ soccer, Waynflete’s Brandon Salway has worked with at least 10 players who observe Ramadan, including four this season. In years past, Waynflete has played in state tournament games in October and November, in years when Ramadan is observed during the fall. Salway has seen games when players forgo water breaks and postgame meals, and players who have stopped during practices or even during games to find a place to pray. Last fall, Horor played soccer at Waynflete and had several teammates who observed Ramadan. He had teammates whom he prayed with, as well as teammates who understood their collective observance and who, like Nabi’s teammates, abstained from eating or asked Horor beforehand if they could eat in front of him. Nabi began her soccer season Friday, and she is the only player on the Portland girls’ soccer team to observe Ramadan. Her brother, Fazal, has several teammates who observe Ramadan. In the Muslim community at Portland High, Nabi knows of Muslims who observe Ramadan and others who do not. She observes Ramadan independently and prefers not to invade others’ observation of the holy month. At the same time, she is surrounded by friends and teammates who understand and respect her observance. Horor knows of Muslims who do not observe Ramadan and he does not judge them. He has his reasons for observing Ramadan.